Figure 8-37.Preferred connections for a typical telephone dialer. 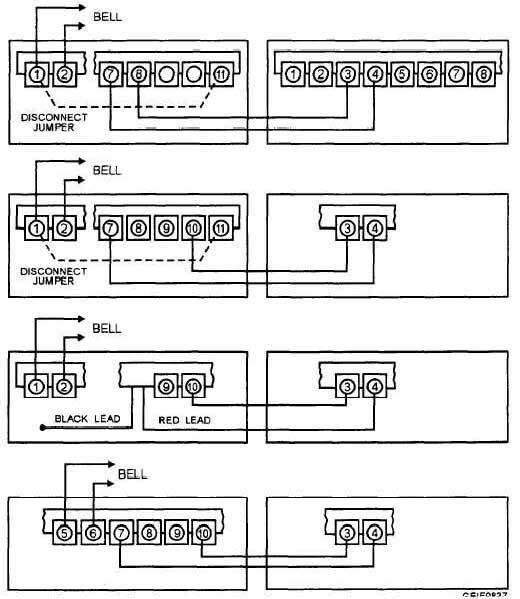 Home > Construction Training Manuals > Construction Electrician Intermediate > Figure 8-37.Preferred Connections For A Typical Telephone Dialer. 2. When FIRE-channel priority seizure has occurred, the dialer overrides its normal end-of-cycle stop and runs for another full cycle. This ensures transmission of the entire priority program, even if the FIRE-channel take-over occurred near the end of a BURGLAR-channel cycle. 3. Even if the dialer has stopped after transmitting the full BURGLAR-channel program and the burglar- alarm input is still present, an input on the FIRE channel causes immediate transmission of the FIRE-channel program. Each of the channels of the dialer can be triggered by a switched dc voltage, a dry-contact closure, or a dry-contact opening. The trigger inputs may be either momentary or sustained. In either case, the dialer transmits its full program, then stops and resets itself. An input that is still present when the dialer stops must be removed briefly and then applied again to restart transmission on that channel. A sustained input does not make the dialer transmit or interfere with normal use of the telephones, nor does it interfere with triggering and operation of the dialer on its other channel. When available, an appropriate dry-contact closure should be used instead of a switched voltage for the dialer-trigger input. Figure 8-37 shows the preferred connections for a typical telephone dialer. Figure 8-37. - Preferred connections for a typical telephone dialer.